You can review the transactions and message information associated with your Text account by viewing the Text history. Click the Admin icon ( ) in the sidebar, then select Channels > Text. 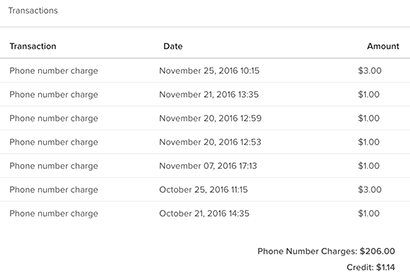 In the Transactions table, you can review a detailed list of charges including the type, date, amount, and overall totals. In the Message details table, view information about each of the texts sent to and from your account, including linked tickets and agents. Message ID, the unique identification number given to the text. Ticket ID, the ticket number associated with the text. You can click the number in this column to view the ticket. Date, the time and day the text was sent/received. Direction, whether the text was from a customer, or to a customer. From, the phone number that sent the text. Status, the current status of the text. See About Zendesk Text statuses for more information. Agent ID, the unique identification number for the agent assigned the text. You can click the number in this column to view the agent's profile. There are several stages a SMS message goes through before it is delivered to the customer. You can find the current status of a SMS message in the Message details table, described above. This article goes through each status and what they mean. Accepted: When a request is first sent to Twilio through an API request to create a new text message, this is the first response received by the client. Twilio will now try to associate the correct ‘From’ phone number for the message. Queued: Once Twilio finds the correct ‘From’ phone number, the message is now queued to be sent out. Sending: Twilio will now start the process of sending out your message to the nearest upstream carrier in the SMS network. Sent: The message was successfully sent to the nearest upstream carrier and has been accepted for delivery. Delivered: Twilio has received confirmation from the upstream carrier that the message was delivered to the recipient. Failed: The upstream carrier did not accept the message from Twilio. Received: Each incoming message to your Zendesk Text number will have a received status associated with it. Undelivered: The message was not delivered and can be caused by a variety of reasons listed here.